John Davidson Rockefeller was born in Richford, New York in 1839. He attended the Cleveland Central High School and at 16 he became a clerk in a commission house. Determined to work for himself, Rockefeller saved all the money he could and in 1850 went into business with a young Englishman, Maurice Clark. The company, Clark & Rockefeller Produce and Commission, sold farm implements, fertilizers and household goods. 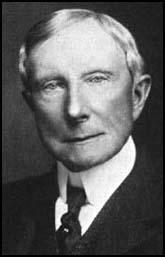 Rockefeller's company was fairly successful but did not bring him the wealth he desired. In 1862 Rockefeller heard that Samuel Andrews had developed a better and cheaper way of refining crude petroleum. Rockefeller sold his original business and invested it in a new company he set up with Andrews called Standard Oil. One of the business problems that Rockefeller encountered was the high cost of transporting his oil to his Cleveland refineries (40 cents a barrel) and the refined oil to New York ($2 a barrel). Rockefeller negotiated an exclusive deal with the railway company where he guaranteed sixty car-loads a day. In return the transport prices were reduced to 35 cents and $1.30. The cost of his oil was reduced and his sales increased dramatically. Within a year four of his thirty competitors were out of business. Eventually Standard Oil monopolized oil refining in Cleveland. Rockefeller now bought out Samuel Andrews for a million dollars and turned his attentions to controlling the oil industry throughout the United States. His competitors were given the choice of being swallowed up by Standard Oil or being crushed. By 1890 Rockefeller's had swollen into an immense monopoly which could fix its own prices and terms of business because it had no competitors. In 1896 Rockefeller was worth about $200 million. In November 1902, Ira Tarbell, one of the leading muckraking journalists in the United States, began a series of articles in McClure's Magazine on how Rockefeller had achieved a monopoly in refining, transporting and marketing oil. This material was eventually published as a book, History of the Standard Oil Company(1904). Rockefeller responded to these attacks by describing Tarbell as "Miss Tarbarrel". President Theodore Roosevelt, who had been elected on a program that included reducing the power of large corporations, attempted to use the Sherman Anti-Trust Act to deal with Rockefeller's monopoly of the oil industry. This was largely ineffective and it was not until 1911 that the Supreme Court dissolved the Standard Oil monopoly. The various press campaigns against Rockefeller had turned him into one of America's most hated men. A devout Baptist, Rockefeller began giving his money away. He set up the Rockefeller Foundation to "promote the well-being of mankind". Over the next few years Rockefeller gave over $500 million in aid of medical research, universities and Baptist churches. He was also a major supplier of funds to organizations such as the Anti-Saloon League that was involved in the campaign for prohibition. By the time that he died died on 23rd My, 1937, John Davidson Rockefeller had become a popular national figure. (1) John D. Rockefeller was interviewed by the United States Industrial Commission in 1899. He was asked about the advantages of industrial combinations to companies such as Standard Oil. It is too late to argue about the advantages of industrial combinations. They are a necessity. And if Americans are to have the privilege of extending their business in all the states of the Union, and into foreign countries as well, they are a necessity on a large scale and require the agency of more than one corporation. Their chief advantages are: (1) command of necessary capital; (2) extension of limits of business; (3) increase of number of persons interested in the business; (4) economy of the business; (5) improvements and economies which are derived from knowledge of many interested persons of wide experience; (6) power to give the public improved products at less prices and still make a profit for stockholders; (7) permanent work and good wages for labourers. Labor and Capital are rather abstract words with which to describe those vital forces which working together become productively useful to mankind. Reduced to their simplest terms, Labor and Capital are men with muscle and men with money - human beings, imbued with the same weaknesses and virtues, the same cravings and aspirations. also live to play, to mingle with their fellows, to love, to worship. The test of the success of our social organization is the extent to which every man is free to realize his highest and best self; and in considering any economic or political problem, that fundamental fact should be recognized. human beings, with flesh and blood, with hearts and souls; and if, likewise, the workmen realize that managers and investors are themselves also human beings, how much bitterness will be avoided! Are the interests of these human beings with labor to sell and with capital to employ necessarily antagonistic or necessarily mutual? Must the advance of one retard the progress of the other? Should their attitude toward each other be that of enemies or of partners? The answer one makes to these fundamental questions must constitute the basis for any consideration of the relationship of Labor and Capital. Our difficulty in dealings with the industrial problem is due too often to a failure to understand the true interests of Labor and Capital. And I suspect this lack of understanding is just as prevalent among representatives of Capital as among representatives of Labor. In any event the conception one has of the fundamental nature of these interests will naturally determine one's attitude toward every phase of their relationship. are men who hold that Labor is the producer of all wealth, hence is entitled to the entire product, and that whatever is taken by Capital is stolen from Labor. If this theory is sound, it might be maintained that the relation between Labor and Capital is fundamentally one of antagonism, and that each should consolidate and arm its forces, dividing the products of industry between them in proportion as their selfishness is enforced by their power. But all such counsel loses sight of the fact that the riches available to man are practically without limit, that the world's wealth is constantly being developed and undergoing mutation, and that to promote this process both Labor and Capital are indispensable. If these great forces cooperate, the products of industry are steadily increased; whereas, if they fight, the production of wealth is certain to be either retarded or stopped altogether and the wellsprings of material progress choked.